Our Housing Needs Survey has now closed. Thank you to all those that took the time to respond. We received 62 responses, which gives us some good evidence to prove to funders that we need more homes in North Harris and Scalpay. We want to build on the success of the Scalpay Care Unit project to build homes that will retain young people and families in the community. The survey highlighted the need for starter homes for young people looking to move out of the family home. There were also those with growing families that need more space. In addition to meeting the needs of the local community, we aim to attract new people to the area. 55% of respondents were from outside the estate, with surveys returned from South Harris and Lewis as well as over the Minch. One interesting fact was the number of people looking for rental property that had not registered with HHP – the local social landlord. A large portion of these were from the young people looking for first homes. These responses contributed to 60% of surveys requesting 2 bed properties. 20% of preferences were for 3 bed properties. The survey also highlighted the two big issues facing people looking for housing. The housing market is Harris is limited, with little availability or choice. Secondly, cost is the most common barrier stated. Whilst prices are still low here compared to the mainland, wages are also low meaning that many properties are not affordable to the local community. The data gained from this survey will now be fed into the Feasibility Study that is underway to develop a number of houses at Ardvourlie. We hope to have the results of that study in April. Should this be favourable, we hope to submit a full bid to the Rural Housing Fund to secure a slice of their £25M for affordable homes in rural Scotland. 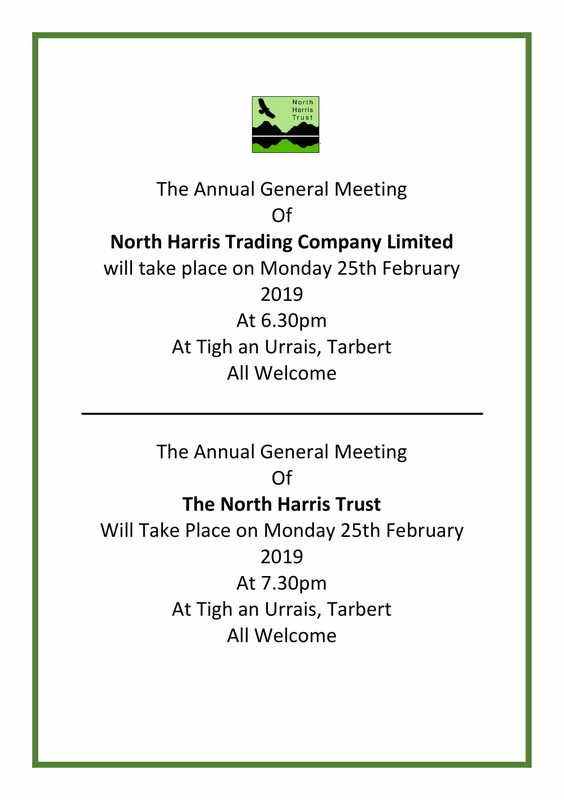 It has been a busy week here at NHT so far with our AGM on Monday night and a helicopter deer count taking place across the Estate. Fortunately the weather held out just long enough for us to successfully carry out the count. 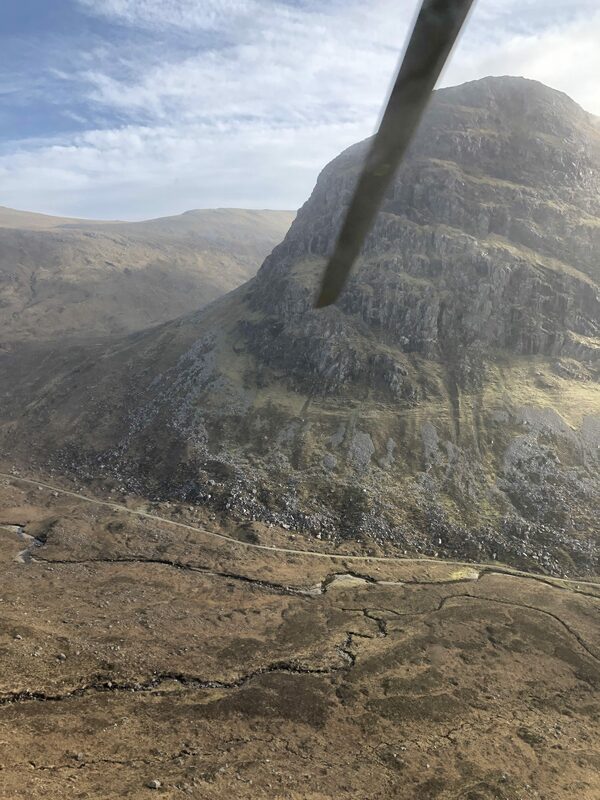 Thanks are due to PDG Aviation Services and Scottish Natural Heritage for their assistance and expertise in helping us get a good picture size of the Red Deer Herd. Below are a few pictures captured during the flights. Posted in Uncategorized | Comments Off on Busy Week at NHT!! We are pleased to release our progamme of guided walks for the 2019 season which will begin on 7th April with walks of all levels there is something for everyone. 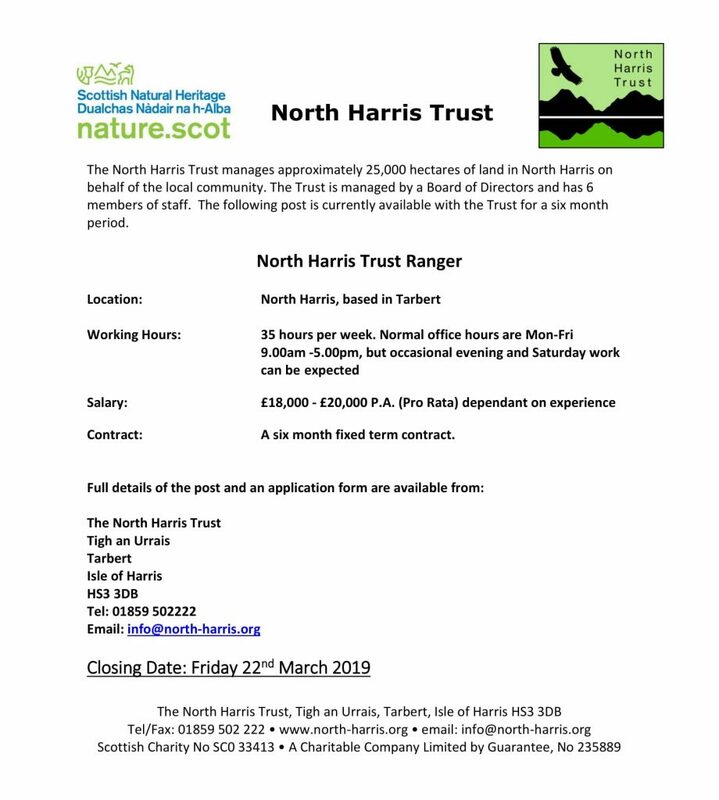 We hope that you will be able to join our Ranger Daryll at some point over the season to enjoy spectacular landscape of North Harris. 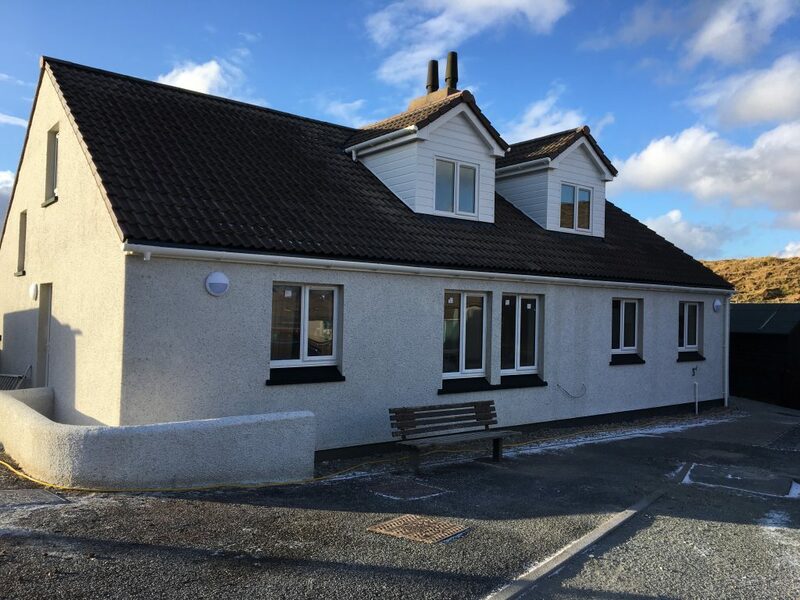 We are now accepting applications for the tenancy of Flat 2 Tigh An Urrais, a 2-bedroom property above our office in Tarbert. The monthly rental for the flat is £273.15 (exclusive of rates and utilities). Over the last few weeks we have been working on a project to draw more people to the woodland at Ardvourlie. The 100ha broadleaf tree plantation was planted as part of the Millenium Forest program some 18 years ago. Despite there being tourist signs on the road next to the Scaladale Centre, the woodland sees very few visitors. With the help of both a university group and local crofter, we have started carrying out routine maintenance on the circular path. Our plan now is to install a building and picnic table, half way round the 60 minute walk. 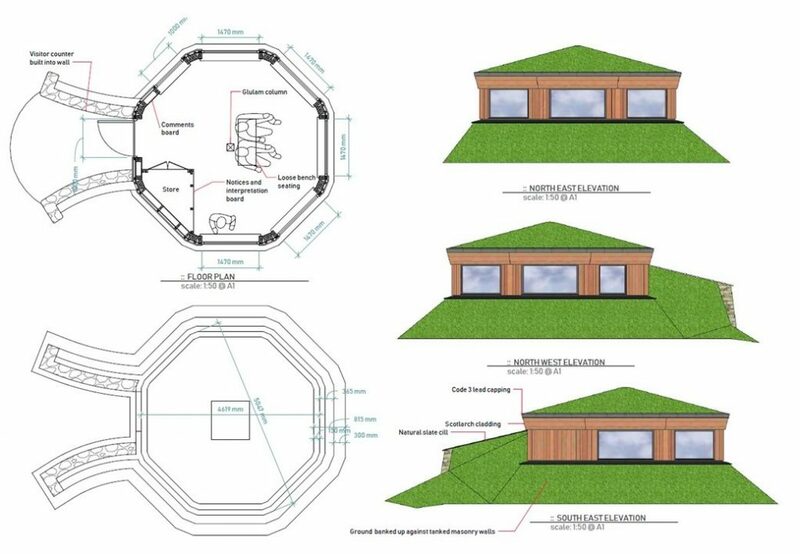 The Woodland Observatory will sit at an elevated position offering 270 degree views over Loch Seaforth and up the Vigidale valley. Sitting on the existing circular path, the Woodland Observatory will be a signed destination for visitors, allowing them to rest and shelter. They will be able to watch the increasing number of birds in the maturing woodland and learn about the local environment from information panels inside. Last week we hosted one of the The John Muir Trust work parties. A team of volunteers sign up to learn what’s involved in managing wild land throughout Scotland. This time, as well as some familiar faces, there were two students that came all the way from Czech Republic to help. During the week there were the ususal beach cleans. The work-party also spent time making some improvements to the path that leaves Huisinis for Traigh Mheilein. We are very grateful for the labour, but also the technical skills that JMT bring with them to Harris. During the week there was also another overseas visitor at Huisinis. 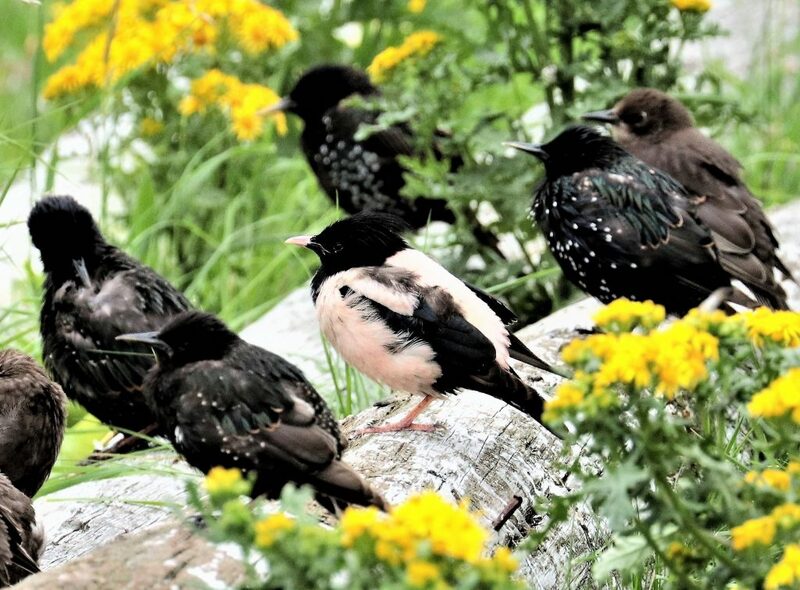 One of the volunteers managed to capture a Rose Coloured Starling amongst the usual residents. This rarity should be in Eastern Europe/Russia at this time of year. Presumably he too had seen all the media coverage of Harris of late and wanted to pay a visit! 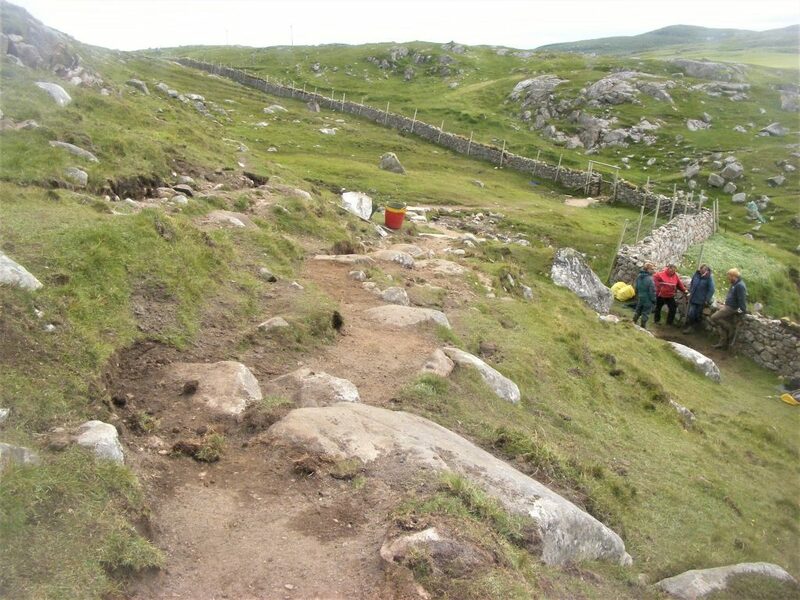 The North Harris Trust is proposing to build some mountain biking trails in a few locations around North Harris. The trails will be purpose-built for mountain biking and will be graded for difficulty like ski runs. Mountain biking is extremely popular in the UK with Scotland rated as one of the best destinations in the world for the sport. Mountain biking is worth millions of pounds to Scotland’s economy annually and has helped small scale regeneration of some local economies. There are numerous riders on Harris and Lewis both young and old. This number swells during the summer months. Traditionally people have ridden the estate paths until the mountain bike trails in Lews Castle grounds were built in 2014. These trails have proven to be a great success with local cyclists and are frequently used by local activity centres and schools to deliver P.E lessons. It would give the local school a new facility to deliver National Curriculum P.E lessons. We are right at the beginning of this project and we need to find out how much local support there would be for such a project. Please could you spare a couple of minutes to complete the survey below. Posted in General, Uncategorized | Comments Off on Biking trails?